"This is an easy way to give mashed potatoes a new spin. Leaving the skin on saves time and there are a lot of nutrients in the skin." 1Place potatoes into a large pot and cover with water and salt; bring to a boil. Reduce heat to medium-low and simmer until tender, about 15 minutes. Drain and return potatoes to pot over low heat to evaporate any extra water. Put potatoes through a potato ricer or mash thoroughly with a potato masher. 2Place garlic cloves in a microwave-safe dish; drizzle olive oil over garlic. Microwave on high until garlic is fragrant and tender, 1 1/2 to 2 minutes. Mix garlic and yogurt into potatoes; add more yogurt as needed. 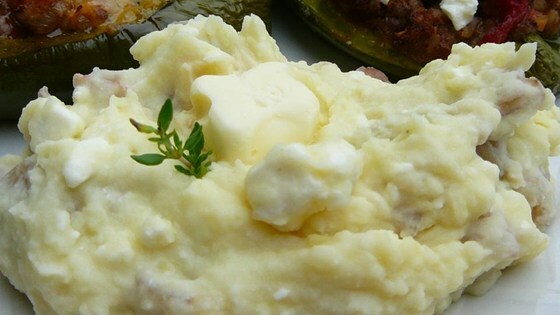 Stir feta cheese into mashed potatoes until melted; top with butter to serve.